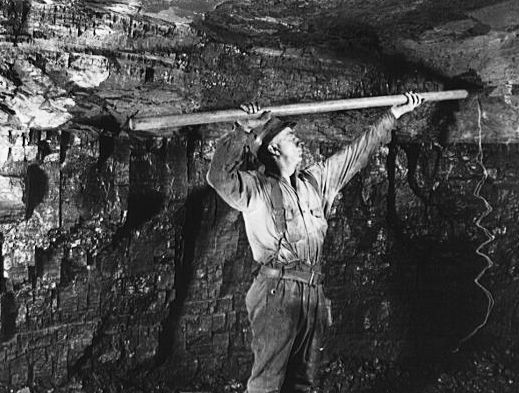 “The historical significance of Pittsburgh was determined, from the beginning, by geography. Whoever commanded the Forks of the Ohio commanded the great interior of the continent – the rich Ohio Valley, drained by a dozen flashing rivers, the Great Lakes, and the mighty Mississippi.” From the book Pittsburgh, The Story of an American City (Henry Steele Commager, Chapter 1, Forts in the Wilderness). The story of the “Forks of the Ohio” – better known as The Point – is really the story of Pittsburgh. For more than 350 years, the area that is now Pittsburgh has been considered a vital location for settlement, trade and industrial output. Because of the strategic location, France, England, the American Indians, and the newly formed United States battled for control of this special place. During the 1660’s, Frenchman Robert de LaSalle explored the Great Lakes region of the United States and Canada, as well as the Mississippi River and Gulf of Mexico. He claimed the entire Mississippi River basin (including what is today Pittsburgh) for France. However, as early as 1730, both French and British traders began to operate in this frontier territory (called “the Ohio Country”) at the confluence of the rivers and conducted business with a number of American Indian villages in the area. 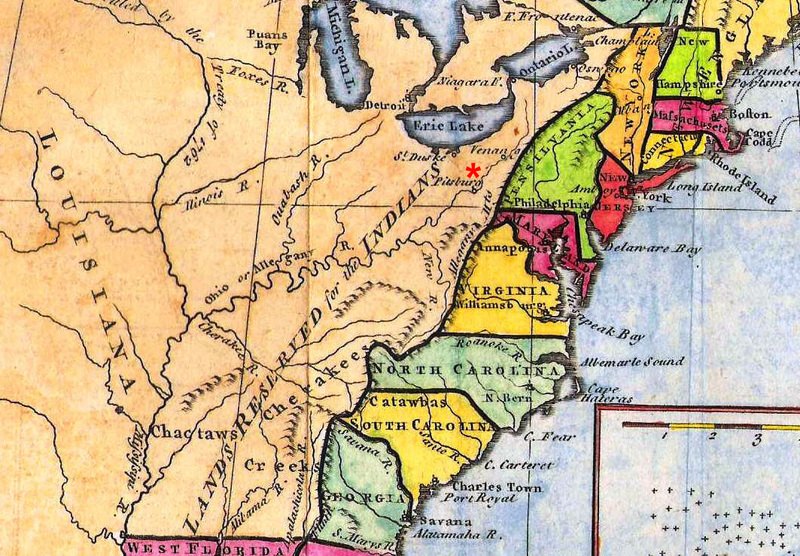 The Governor-General of “New France” (the name given to a large portion of North America colonized by France, including portions of what is today Canada and the United States) was concerned about the presence and expanding influence of British traders in the Ohio Country. During June 1747, he ordered a military expedition through the area to reaffirm France’s territorial claims, develop alliances with the American Indians, and encourage British merchants and fur-traders to leave. The seeds of conflict were sown as the charters of many of the original British colonies granted them land indefinitely to the west. During the early 1750’s the French began constructing a line of forts, including Fort Presque Isle on Lake Erie, Fort Le Boeuf (south of Fort Presque Isle), and Fort Duquesne located at present day Pittsburgh. Robert Dinwiddie, Lieutenant Governor of the Virginia Colony, viewed the actions by the French as a threat to their extensive territorial claims. During late 1753, Governor Dinwiddie sent George Washington (then a Major in the Virginia Militia – Dinwiddie and George Washington’s brother were investors in the territory) to confront the French commander at Fort Le Boeuf and “ask” the French to leave the Ohio Country. Major Washington was rebuffed. Before he returned to Virginia in January 1754, Dinwiddie sent William Trent and a detachment of the Virginia Militia to construct a fort at the forks, to be known as Fort Prince George. During the spring, however, a large force of French and American Indians attacked the Virginians, forcing the small British garrison to surrender. 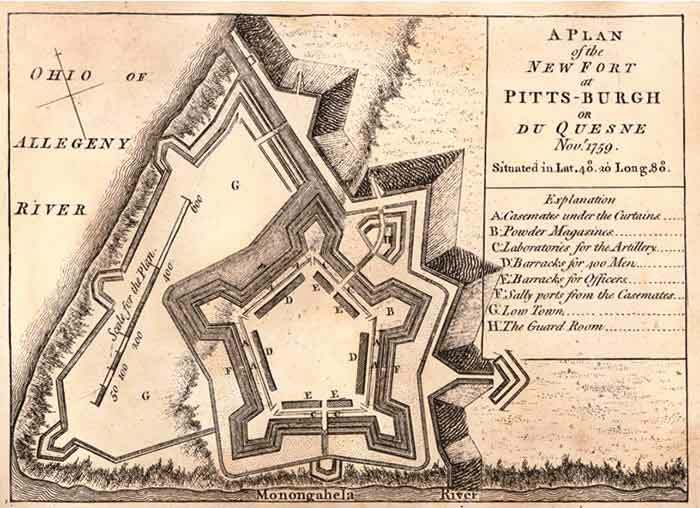 The French destroyed Fort Prince George and proceeded to build Fort Duquesne in 1754. This conflict over the confluence of the three rivers at present day Pittsburgh, was the flashpoint for the beginning of the French and Indian War (1754-1763). Both French and British forces worked to develop alliances and fighting partners with American Indian tribes. The British formulated an aggressive plan of attack. During June 1755, General Edward Braddock (with George Washington as his aide) led a military campaign against Fort Duquesne with an army of 2,000 troops. The expedition was ambushed (near current day Braddock, Pennsylvania), British forces were nearly destroyed, and General Braddock mortally wounded. During the fall of 1758, General John Forbes led an expedition of 6,000 troops to drive the French out of the contested Ohio Country. After the French successfully repelled a British advance party at Fort Duquesne, the French destroyed and abandoned Fort Duquesne as Forbes approached. Seemingly, the British took the fort without firing a single shot, aided by the Treaty of Easton. The Treaty of Easton was an agreement signed in October 1758 (at Easton, PA), during the French and Indian War. Chiefs of more than a dozen American Indian nations agreed to be allies of the British and, in return, the governments of Pennsylvania and New Jersey recognized American Indian rights to hunting grounds in the Ohio Valley and settlements in the Ohio Country. Now firmly in control of this strategic confluence of rivers, and much of the Ohio River Valley, General Forbes named the area “Pittsburgh” in honor of William Pitt, the Elder, Prime Minister of Britain. From 1759-61, Fort Pitt was built near the site of the former Fort Duquesne. However, peace in the wake of the French and Indian War would be short-lived. 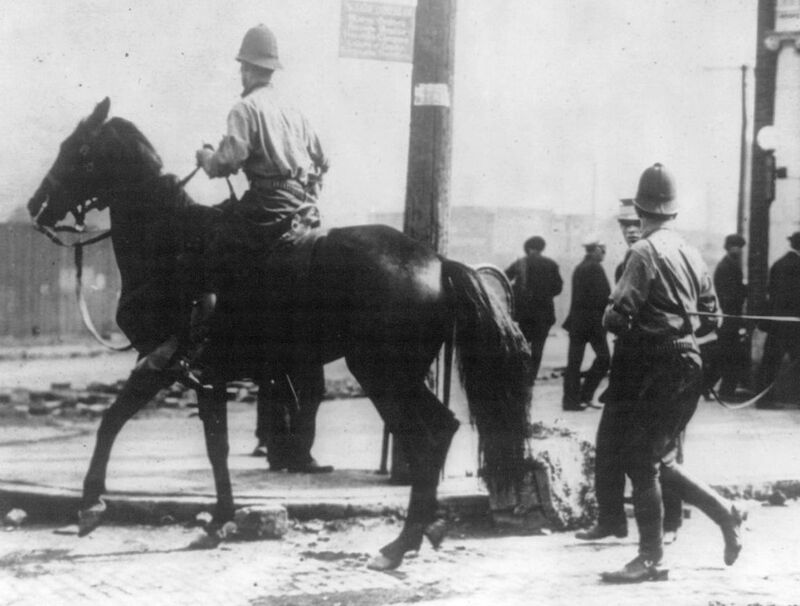 A loose confederation of elements of American Indian tribes, dissatisfied with British post-war policies in the region, instigated an uprising known as Pontiac’s Rebellion in an effort to drive British soldiers and settlers out of the area. Numerous British forts in the Great Lakes and Ohio Valley territories were attacked, including Fort Pitt. During August 1763, a substantial British force (under the command of Colonel Henry Bouquet) left Carlisle, PA moving west to relieve Fort Pitt. 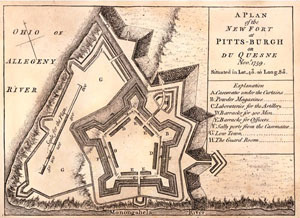 The siege against Fort Pitt was lifted as Bouquet defeated an American Indian contingent at the Battle of Bushy Run (near present day Harrison City, Westmoreland County). 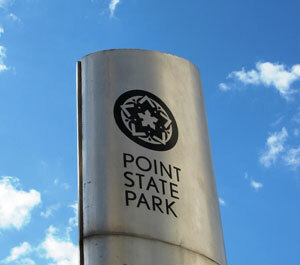 Afterward, Bouquet supervised the construction of the Fort Pitt Blockhouse, which survives today as the only intact remnant of Fort Pitt, located in what is now Point State Park. 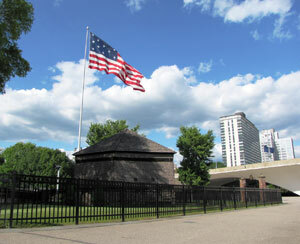 During the years that followed Pontiac’s Rebellion, the importance of Fort Pitt as a British military base began to wane. Plans for a settlement around Fort Pitt were developed in 1764, and the British Crown turned Fort Pitt over to the colonists in 1772. 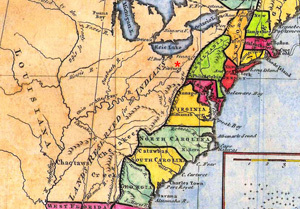 The area did not become a significant community, however, until after the American Revolution of 1776. 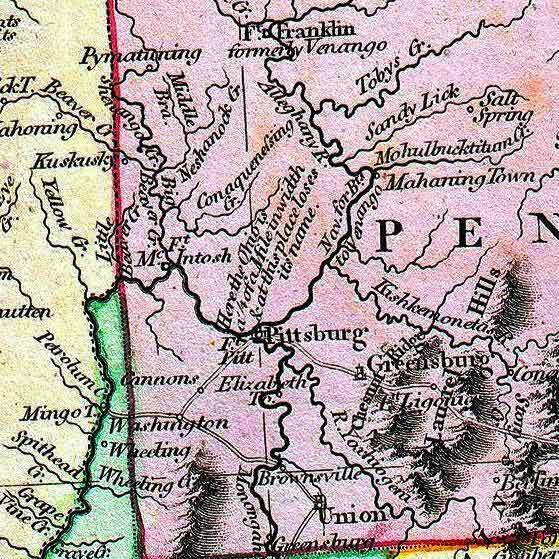 Both Virginia and Pennsylvania claimed the territory, leading to a power struggle during colonial times that continued until 1780 when both “states” agreed to extend the Mason-Dixon Line, placing Pittsburgh in Pennsylvania. Afterward, Pittsburgh’s transformation from a military hub to a commercial hub began to take shape. Pennsylvania formally became a state in 1789, after ratifying the Constitution of the United States. The settlement at Fort Pitt became a borough in 1794. The U.S. Army decommissioned the site and items salvaged from the Fort were sold at auction to area residents in 1797. The first Census of the United States (1800) listed the population of Pittsburgh at 1,565. The War of 1812 cut off the supply of goods to America, as the British blockaded American ports, stimulating the need for domestic manufacturing. 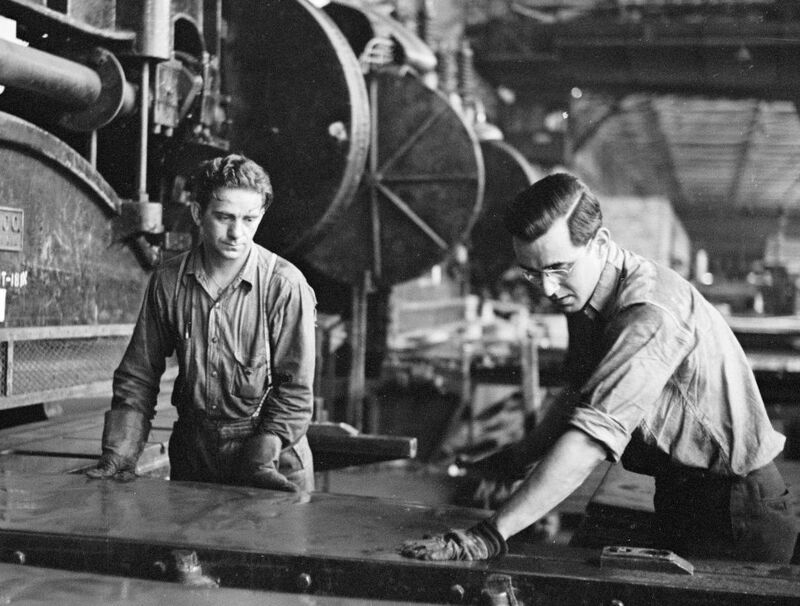 By 1815, Pittsburgh was producing significant quantities of iron, brass, tin and glass products. The Act of March 18, 1816, chartered Pittsburgh as a city. A great fire destroyed large portions of Pittsburgh, including the old Court House that housed the City’s original charter. The first railway extended to Pittsburgh, accelerating industrial expansion and spawning hundreds of factories in the area. The Civil War (1861-1865) boosted Pittsburgh’s economy with increased demand for iron and armaments. 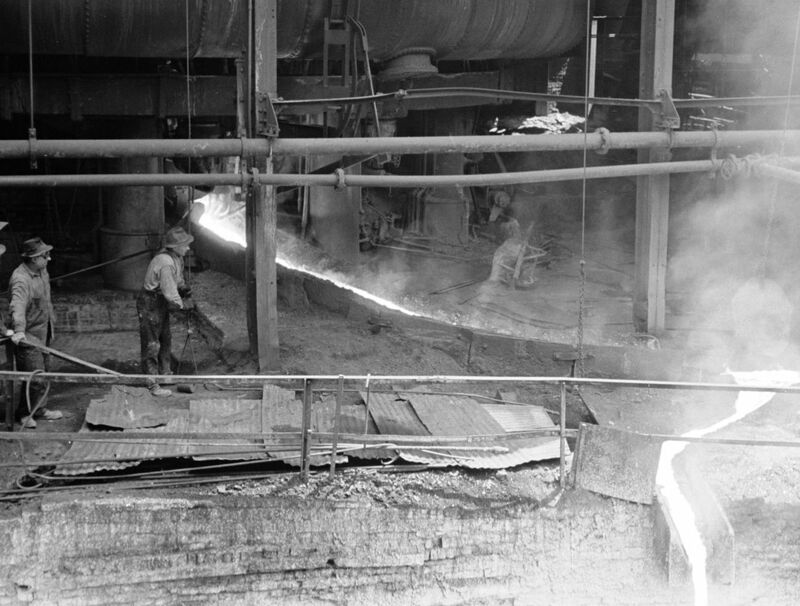 Steel production began by 1875, when Andrew Carnegie founded the Edgar Thomson Steel Works in North Braddock (where French and American Indian forces from Fort Duquesne defeated General Braddock’s campaign in 1755). 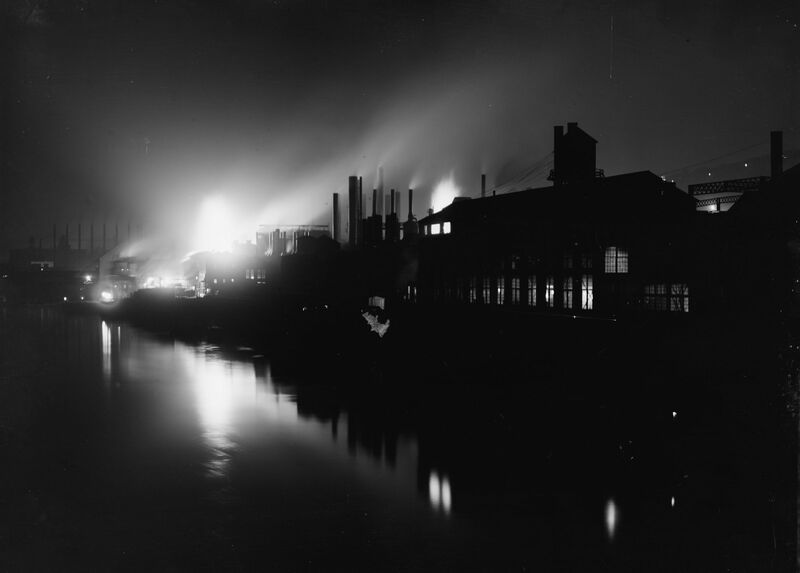 The Edgar Thomson Works, and other mills purchased by Carnegie and his associates, became the Carnegie Steel Company. An investment group led by Elbert H. Gary and J.P. Morgan bought Carnegie Steel for approximately $400 million (roughly $10 billion today) in 1901. Carnegie Steel, combined with Gary’s Federal Steel Company, became the nucleus of U.S. Steel which remains headquartered in Pittsburgh. During its first full year of production, U. S. Steel made 67 percent of all the steel produced in the United States. The success and growth of Carnegie Steel was attributed to Henry Bessemer, inventor of the Bessemer Process, which facilitated the mass production of steel by removing impurities from molten iron. 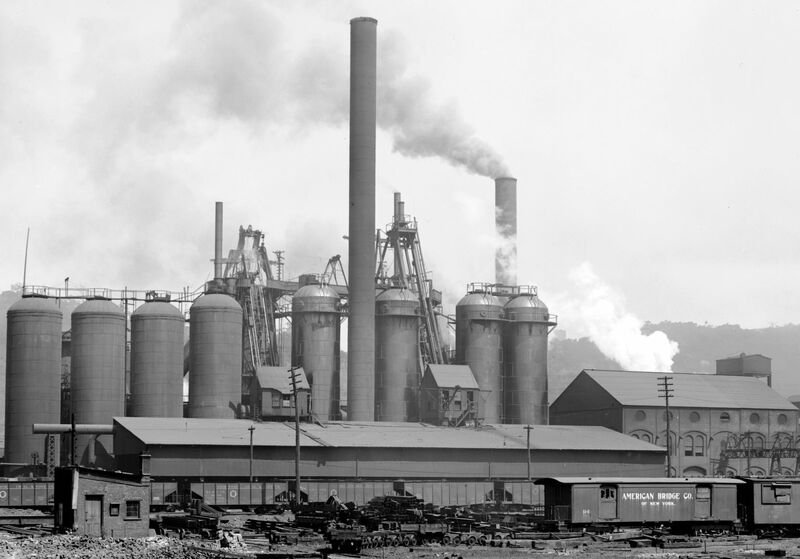 Other steel companies began to form in the 1850’s, including Jones, Lauth and Company and Laughlin and Company. Eventually, they combined to form Jones and Laughlin Steel Company (a.k.a. “J&L”). 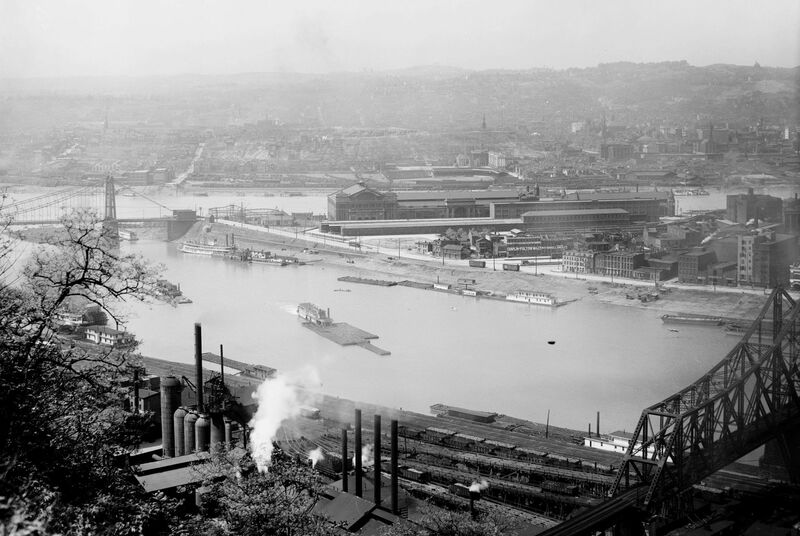 As industrial output expanded in the late 1800’s, the population of Pittsburgh increased exponentially. 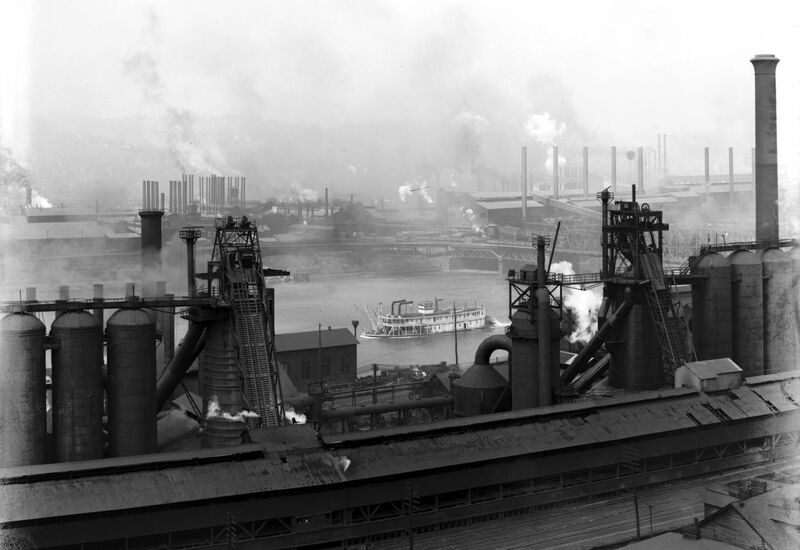 The arrival of immigrants from Europe, and demand for coal, steel and glass to support a growing United States, fueled Pittsburgh’s place as the industrial powerhouse of the world. Transportation was a critical ingredient for growth. 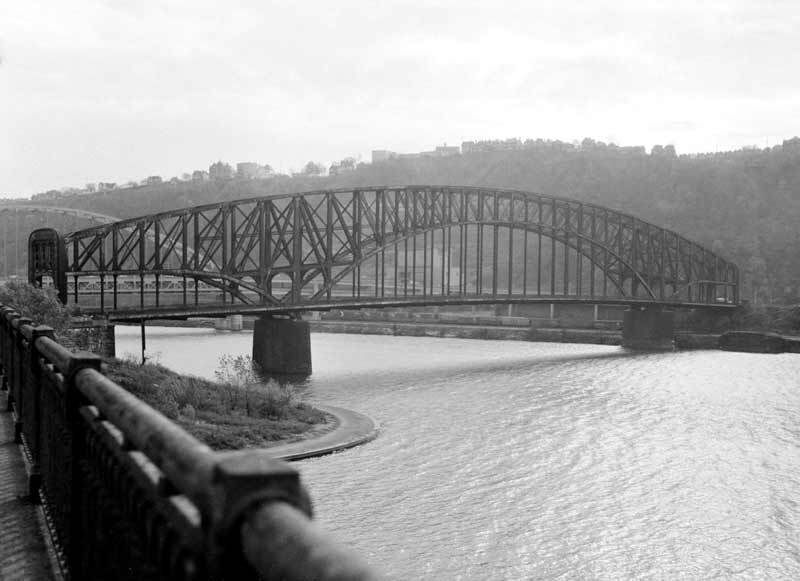 Railroads, bridges and roads were built to traverse the Pittsburgh region’s difficult topography. Bridges became an essential connection for neighborhoods that were literally a stones-throw away. 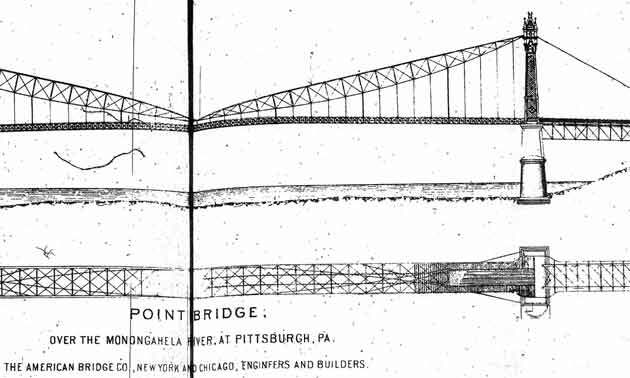 Proposals considered for a “tripartite bridge” that would connect the Point at Pittsburgh – crossing the Allegheny River – with Allegheny City (known today at the North Side and part of the City of Pittsburgh) and the South Side, crossing the Monongahela River. With a projected cost of $1 million, the idea was abandoned. 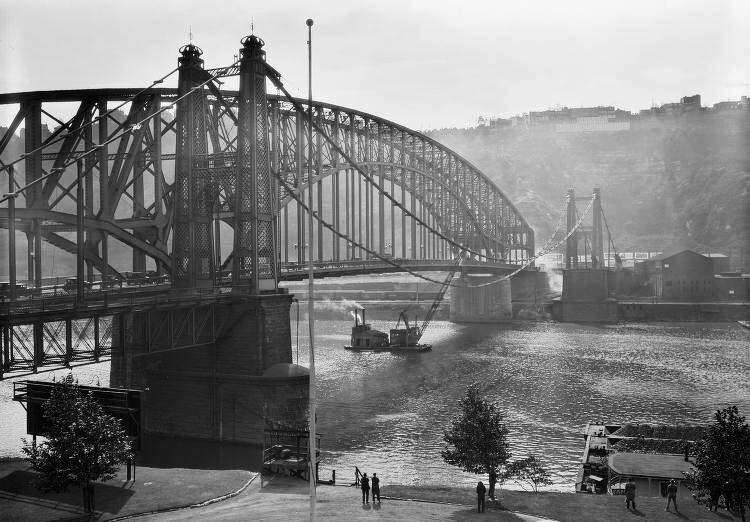 Instead, the Union Bridge was built over the Allegheny River to the north shore. The wooden bridge opened in 1875 and was the first bridge to link the Point with the opposite shore of either river. Now, completing the link from the Point to the south shore (over the Monongahela River) became more important than ever. 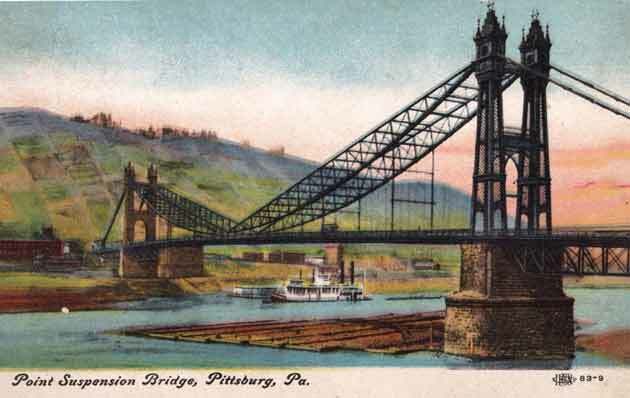 By 1899, Union Bridge was a major cause of the Secretary of War to require all bridges on Pittsburgh’s rivers to be raised higher or replaced. It was too low and obstructed river traffic. Removed in 1907, after it was damaged during the great flood of 1907. Point Bridge Company was formed / chartered (December 26, 1874). The bridge was privately owned, until 1896. Plans approved in May and bids invited for the Point Bridge. Early plans / estimates put the cost at appx. $1.0 million. 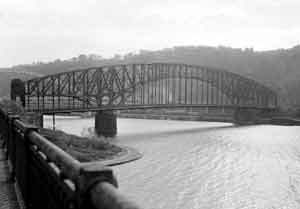 Navigational interests on the Monongahela River were paramount, which complicated the bridge design. The challenge was threefold: 1.) Span the full breadth of the river, 2.) Provide enough clearance / head room for river traffic below, and 3.) Achieve manageable grades for easy approaches to the bridge. 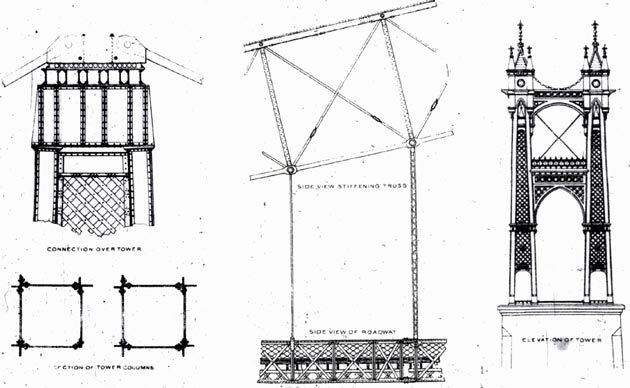 Engineers prepared at least four designs in an effort to balance the navigational and financial concerns. Ultimately, a “light gauge” construction form was selected. Point Bridge is completed and “tested” on April 1 under the watchful eyes of local dignitaries and investors in the Point Bridge Company. 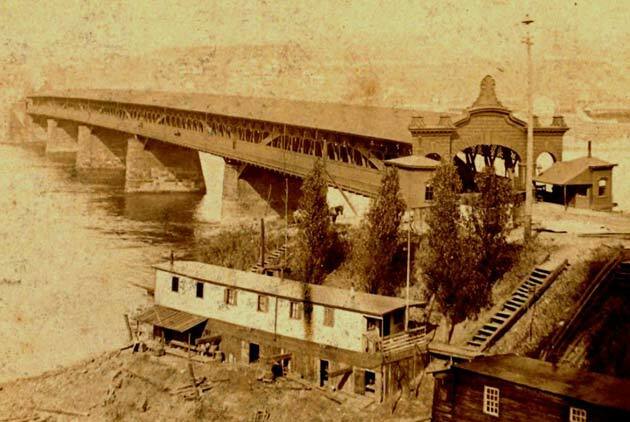 “We are at last enabled to announce the completion of the Point Bridge across the mouth of the Monongahela connecting the lower part of Pittsburg with the South Side and Temperanceville. An informal opening took place yesterday morning, the occasion being the passage over the bridge of Mr. Jacob Painter, one of our oldest citizens and one of the largest stockholders in the bridge, accompanied by Mr. Jas. I. Bennett and a number of personal friends in carriage, among whom we noticed Mr. J.N. McCullough, B.F. Jones, John Chalfant, Campbell Herron, Mark Watson, H.W. Oliver, David Stewart, Alex. Byers, Alex. Nimick and Max Moorhead. The American Bridge company availed themselves of opportunity yesterday, through the kindness of the mill owners of the South Side of making a test of the carrying capacity of the bridge. This weight is equal to 12 locomotives, or to a crowd of over 7,000 people. Altogether there were on the main span at same time 48 teams with 176 horses or mules and about 900 people. With all this load on, the bridge deflected 4 inches in the center of the span, which is only ½ of an inch for every 100 feet of span, whereas the deflection allowed in railroad bridges is almost 1 inch for every 100 feet. … The designer of the bridge, Mr. Hemberle, stated that his expectations in respect to rigidity in the bridge were quite surpassed by the results. Point Bridge can certainly be claimed to be the first successfully stiffened suspension bridge in the world, and considering its magnitude, together with the design and workmanship, is and will remain a model of an engineering structure. All the parties witnessing the test expressed their astonishment about the rigidity of the structure, and wish a lease of life for the time this structure will remain an ornament to the city. After this was over the company repaired to Mr. Painter’s office, where they were served with a sumptuous repast . Point Bridge opens to general traffic on April 11, after thorough load testing by horse and mule teams. The total project cost was about $525,000, a tremendous achievement from an engineering and construction standpoint. 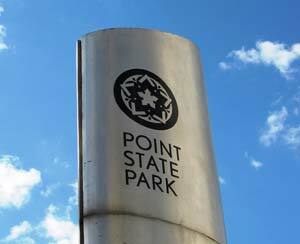 City of Pittsburgh acquired Point Bridge from the Point Bridge Company for $400,000. It was the first local span to be municipally acquired, as a direct result of public outcry for “free” bridges in Pittsburgh. City of Pittsburgh conducts a thorough inspection of Point Bridge and discovers a number of deficiencies. However, no money could be appropriated for making repairs. Point Bridge was closed to heavy traffic in December when it was discovered that 3 floor beams were broken. Pittsburgh Construction Company begins work in June on a $92,000 contract for reconstruction and strengthening of Point Bridge. The work is completed on November 28, 1904. In addition to the structural work, ornamental sheet metal domes were substituted for the former light grill work at the top of the suspension towers. 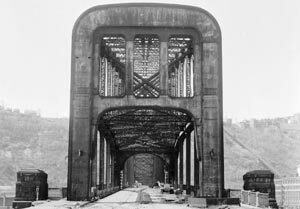 Although repaired and strengthened, engineers concluded that Point Bridge was still fragile (due to age and its light gauge design) and would eventually need to be replaced. Point Bridge is closed to heavy traffic. Public pressure increases on the city and county for prompt action in building a new bridge. 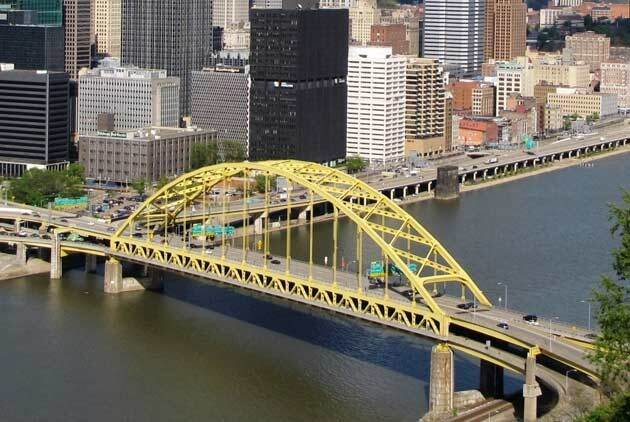 The Allegheny County Department of Public Works, in conjunction with County engineers, began to assess design alternatives for a new Point Bridge. Funds for the new bridge ($2,325,000) were raised through an Allegheny County bond issue. 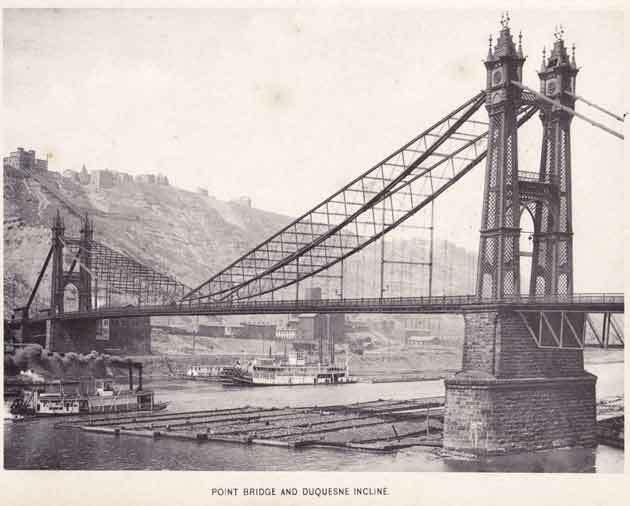 The City of Pittsburgh and Allegheny County studied a variety of span lengths, clearances, and designs. County Commissioners approved final plans for a bridge that would run parallel to the old Point Bridge and avoid obstructing the river channel with a through-cantilever design. The overall length of Point Bridge II was over 1300 feet, with 430 feet of main span clearance for traffic on the Monongahela River. The span accommodated four lanes of traffic and two sidewalks. Construction begins on Point Bridge II in April. Sprague and Henwood, core-drilling contractors, handled the foundation for the main piers. 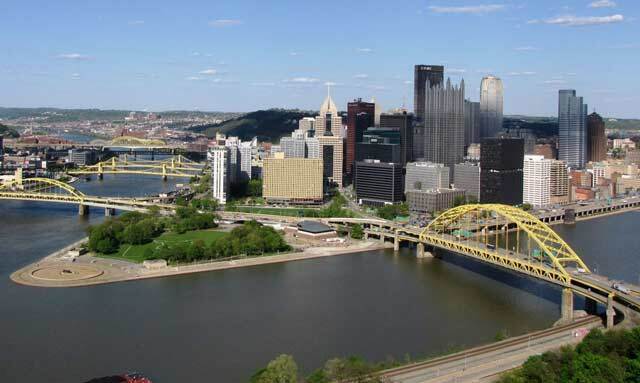 Dravo Construction Company of Pittsburgh was awarded the contract for the piers and approaches, while the Fort Pitt Bridge Works was awarded the contract for fabricating and erecting the steel superstructure. Point Bridge II opened to traffic on June 20. The completed span was ceremoniously passed to the people of Allegheny County from the County Commissioners and the Director of Public Works. Point Bridge I was demolished shortly after the opening of Point Bridge II. With an increase in motor vehicle traffic, and a boom in housing development after World War II, Pittsburgh’s suburbs – particularly the South Hills – rapidly expanded. Point Bridge II had reached its capacity. 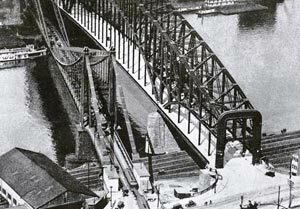 Construction begins on the new Fort Pitt Bridge, a double-decker, steel bowstring arch bridge designed by George S. Richardson. Fort Pitt Bridge opens to traffic on June 19, fifteen months before the completion of the accompanying Fort Pitt Tunnels. 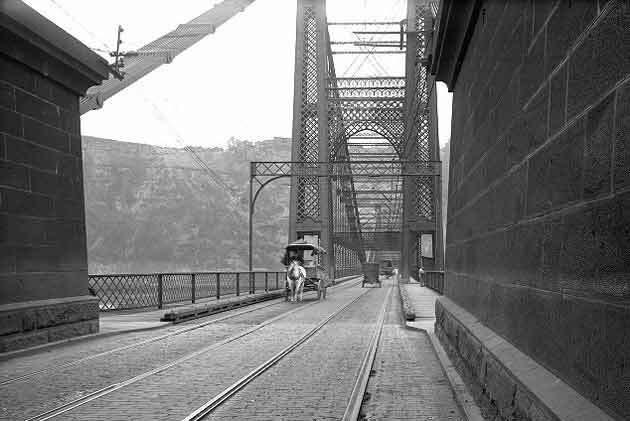 The adjacent Point Bridge II was closed two days after the opening of the Fort Pitt Bridge and stood idle until it was demolished in 1970. The Fort Pitt Bridge is one of the most heavily traveled roads in the Commonwealth of Pennsylvania, with an average daily traffic volume of nearly 100,000 vehicles. It provided a critical link between downtown Pittsburgh and the city’s expanding suburbs in the south – known locally as the “South Hills”. Pete's expertise has proven invaluable.